Back to school season is an exciting time for me and always has been ever since I was a little kid. Starting fresh, making new friends, sporting new clothes and packing up my school bag with classroom essentials were all part and parcel of the excitement in my school age years. But, for those who can't afford the latest school supplies, they may not share the same sentiment. Fortunately, Avery Products Canada is giving back to school communities across Canada by providing students with complimentary Avery school supplies for the 2016/17 school year as part of the #AveryGivesBack campaign. In conjunction with The Michael “Pinball” Clemons Foundation (MPCF) and change maker Hannah Alper of Toronto, Avery Products Canada delivered 7,500 school supply kits to students across the MPCF network of schools in need. 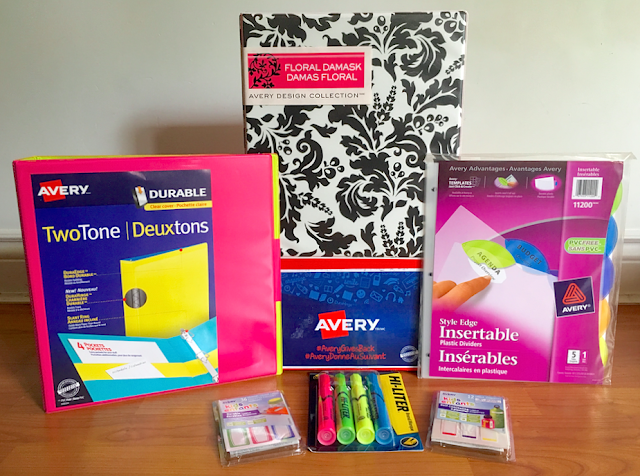 Avery Products Canada’s #AveryGivesBack campaign aligns with MPCF founding principle of empowering youth and inspiring dreams by helping to prepare students for the upcoming school year with essential tools such as Binders, Dividers, Hi-Liters and Kids ID Labels. Throughout this campaign, Michael “Pinball” Clemons and Hannah Alper have been busy capturing the kitting and delivery of these school supplies on video in the hopes that others will join the give back movement in their own communities. Connect with Avery on Facebook to Help Give Back Even MORE! Visit Avery Products Canada on Facebook and share their special "Give Back" video. For every video share, Avery Canada will donate $1 CAD to the Michael 'Pinball' Clemons Foundation! This is awesome what Avery is doing! !